type.co.uk is the online, font retail arm of Fontworks UK Limited and was the World's first digital online font shop that originally went 'live' in 1994. We endeavour to provide quality typeface products that are easy to access, purchase and download, put quite simply - we sell fonts. With literally thousands of fonts to choose from (over 100,000 online) you should be able to find whatever you need right here, if not, just send an email to sales@type.co.uk and we'll track it down for you. 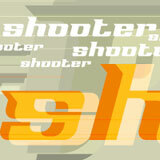 We can obtain fonts from just about any source and advise about commercial use and all that licensing stuff. Online right now you will find fonts from a huge range of foundries from right around the globe: key majors such as Adobe, Linotype, Monotype, Berthold, ITC, Bitstream, Ascender; independents URW++, Font Bureau, Dalton-Maag, G-Type, LucasFonts, Jeremy Tankard, Mark Simonson, DSType, Elsner+Flake, T26, Positype, plus cutting edge producers such as ACMEFONTS, Virus, Typodermic, Alias, ShinnType, P22, Device and many more. If you can't find an off-the-shelf product or would like to develop your own typeface or logo, we can provide a full range of custom font design and production services, working from any concept. Fontworks is a leading, highly regarded and renowned provider of bespoke font and typeface solutions to the corporate, advertising and design sectors. With vast experience and expertise, our Type UK Design studio is primed and ready to meet the most demanding brief, from headline fonts through to complete family suites. Check out our Custom Fonts page or email your requirements to projects@type.co.uk. We also offer a broad range of consultancy services and advice covering all aspects of Font Licensing, Web Fonts, Corporate Fonts, corporate ID issues, multi-lingual font solutions, contract drafting and legal issues. Contact Us for assistance with any requirement, we're ready to go! If you would like to submit your typeface designs or completed fonts to us for distribution and retailing, please email info@type.co.uk with a description of your products and some pdf samples for us to view.